Relative Race Giveaway: A Family Trip to Disneyland! Enter for the chance to win a FREE Disneyland trip with your family! To kick off the Season 4 premiere of Relative Race (mark your calendars for next Sunday, September 16, 2018! 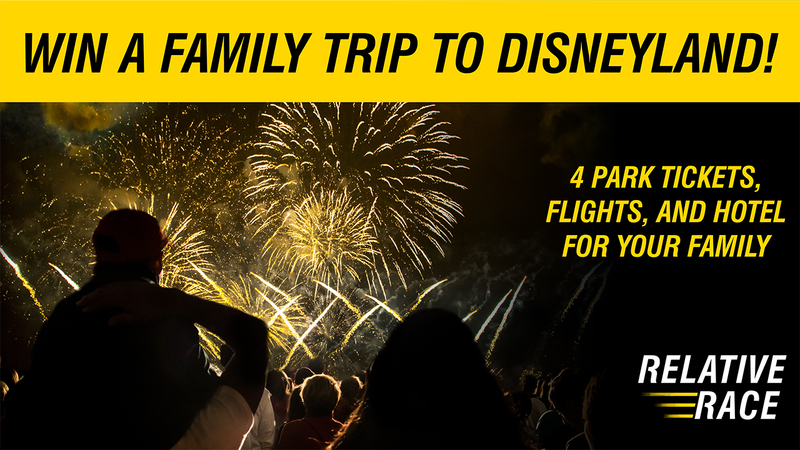 ), we're giving away the family trip of a lifetime to the happiest place on earth. Celebrate family with Relative Race by creating memories with your loved ones in Disneyland! Flights, hotel, and park passes for 4? It's the perfect recipe for magical family memories that'll last forever! If you're new to discovering Relative Race, this first-of-its-kind competition series is one of BYUtv's top shows. Each season brings four new teams who are on a mission to discover family. Contestants race across the country in search of relatives they have never met, in hopes they will reach the finish line first and win the grand prize. The four teams (red, blue, green, black) are given clues and challenges along the way that lead them to people who share the same DNA. The last-place finisher at each stage of the competition receives a strike. Three strikes and that team is out. Seasons 1 through 3 have brought excitement, laughter, and tears to TV viewers. The reunions between relatives, both close and distant, have been unforgettable. You never know who contestants will meet on Relative Race. Don't forget to tune in to BYUtv on Sunday, September 16, 2018, for the Season 4 premiere! Meanwhile, follow Relative Race on Facebook, Instagram, and Twitter.